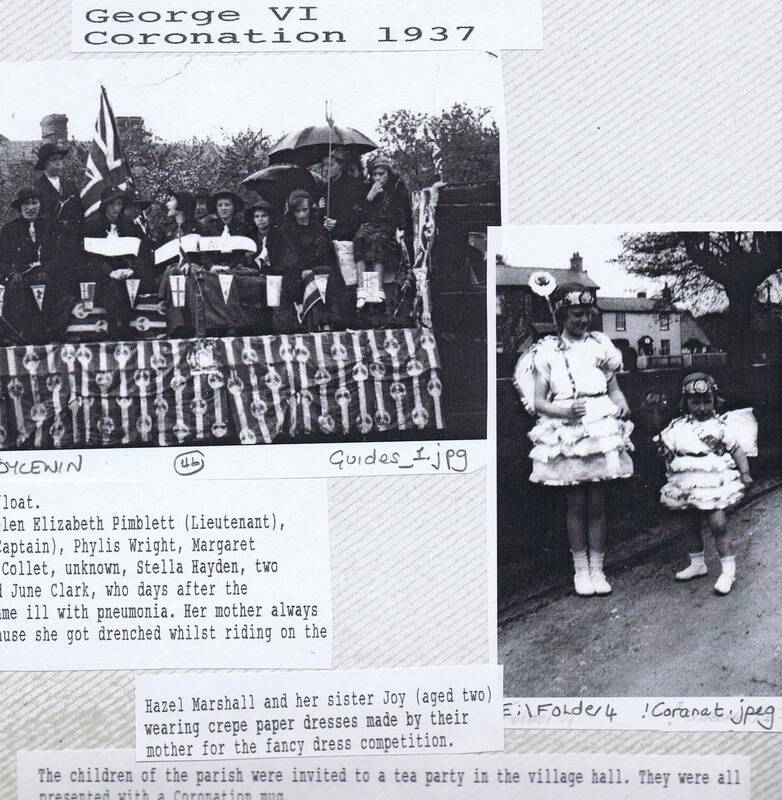 Our grateful thanks to Carol Eaton & Frances Roberts for their permission to reproduce the following photos taken fom their Centennial book 'Memories of Henham'. Sandy Marshall (shepherd), Sandy's friend from London and Bert Snow sit in the doorway of the shepherd's hut on Lodge Farm. 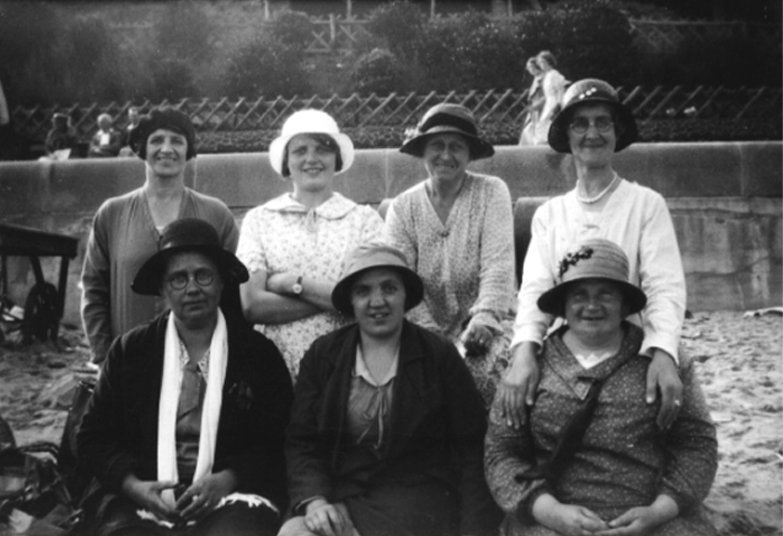 Henham ladies outing to Clacton. Back row left to right: Maud Suckling, unknown, Mrs. Willet, Mrs. Smith. Second row: Mrs. Turner, Ada Brain, Mrs Jakes. c1921. 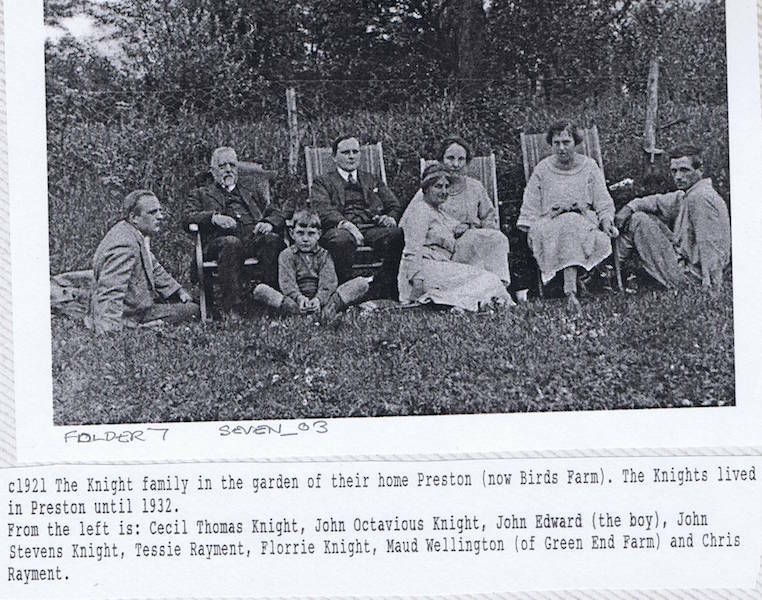 The Knight family in the garden of their home 'Preston' (now Birds Farm). The Knights lived in Preston until 1932. From the left is : Cecil Thomas Knight, John Octavious Knight, John Edward (the boy), John Stevens Knight, Tessie Rayment, Florrie Knight, Maud Wellington (of Green End Farm) and Chris Rayment. 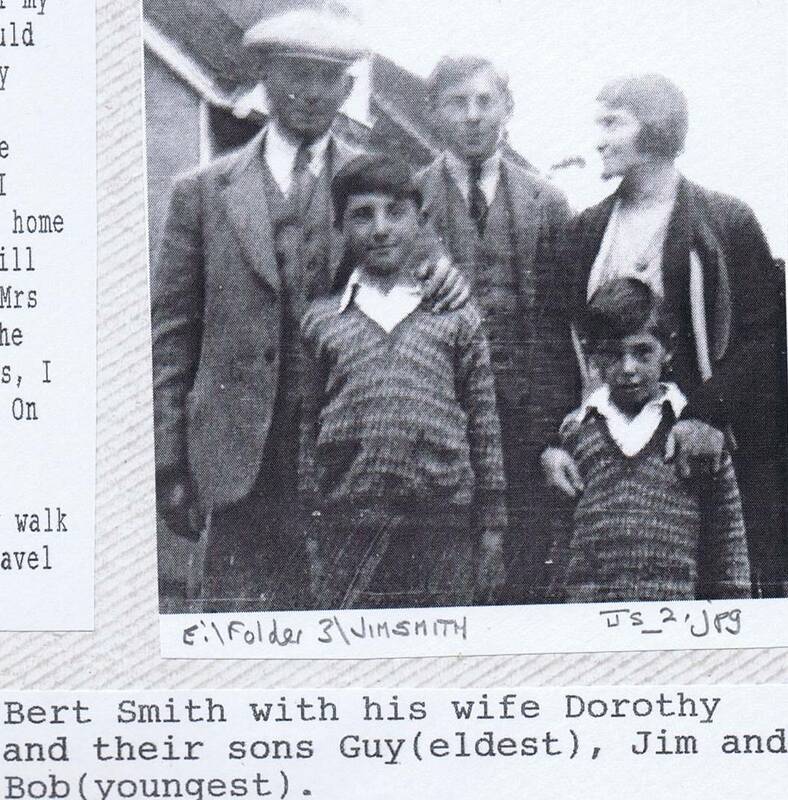 Bert Smith with his wife Dorothy and their sons Guy (eldest), Jim and Bob (youngest). Starr Garage 1953. Pat Meads and his brother. 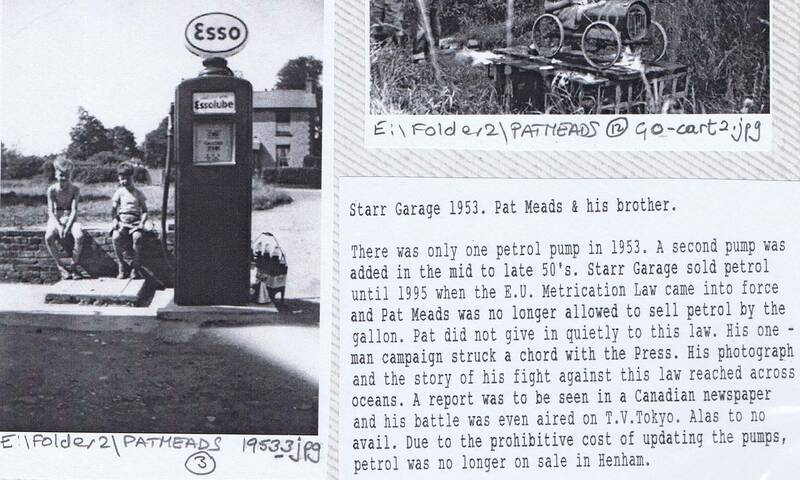 There was only one petrol pump in 1953. A second pump was added in the mid to late 50s. Starr Garage sold petrol until 1995 when the EU Metrification Law came into force and Pat Meads was no longer allowed to sell petrol by the gallon. Pat did not give in quietly to this law. His one-man campaign struck a chord with the Press. His photograph and the story of his fight against this law reached across oceans. A report was to be seen in a Canadian newspaper and his battle was even aired on T.V. Tokyo. Alas to no avail. Due to the prohibitive cost of updating the pumps, petrol was no longer on sale in Henham. 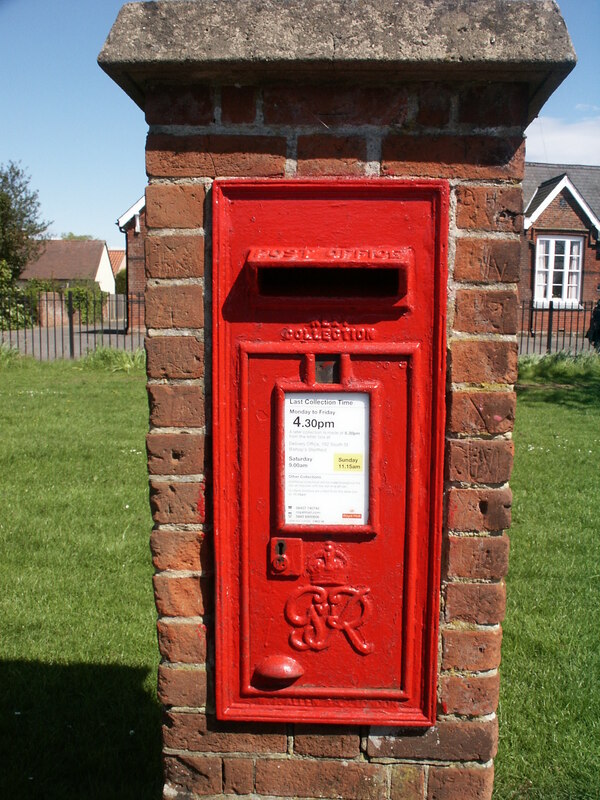 Woodend Green. 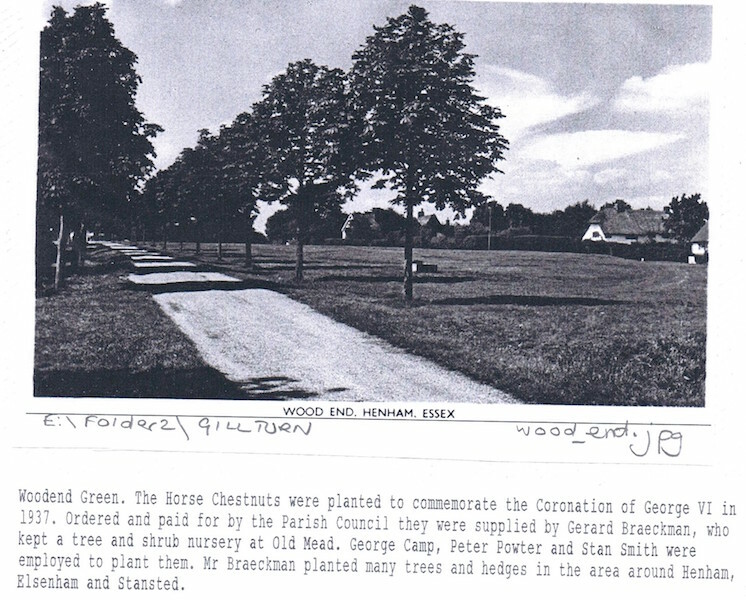 the Horse Chestnuts were planted to commemorate the Coronation of George VI in 1937. 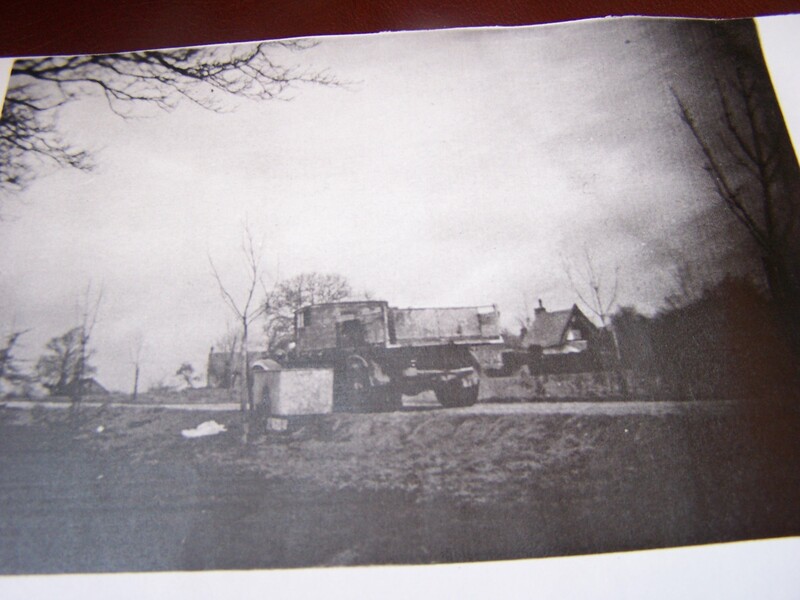 Ordered and paid for by the Parish Council they were supplied by Gerard Braeckman, who kept a tree and shrub nursery at Old Mead. George Camp, Peter Powter and Stan Smith were employed to plant them. Mr. Braeckman planted many trees and hedges in the area around Henham, Elsenham and Stansted. Star Farm mid 1940s. Standing in the farm yard are Amy Meads (Pat Meads' grandmother), Lou McMillan and her daughter Pauline, and Bridie Meads (Pat's mother). 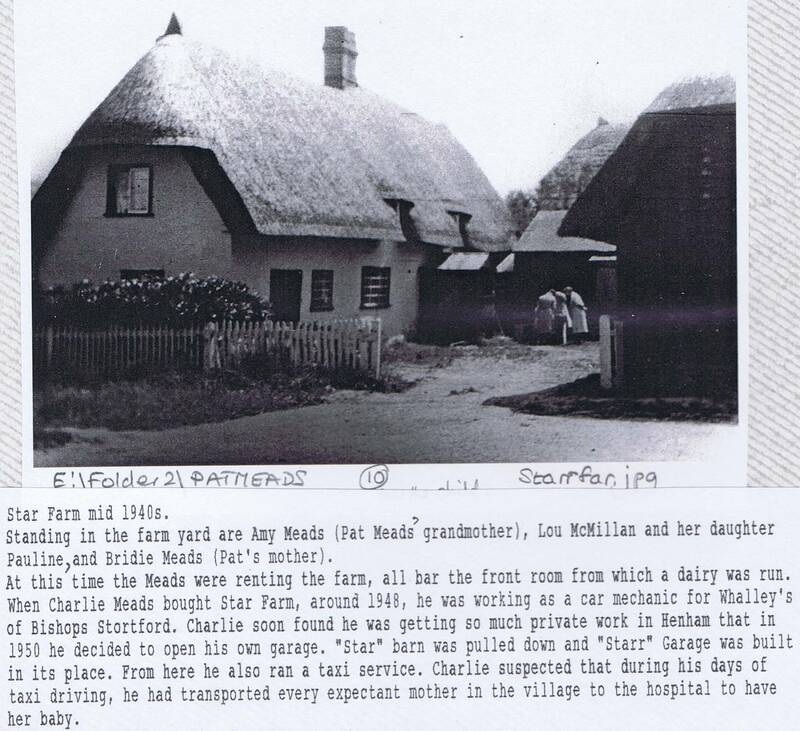 At this time the Meads were renting the farm, all bar the front room from which a dairy was run. When Charlie Meads bought Star Farm, around 1948, he was working as a car mechanic for Whalley's of Bishop Stortford. Charlie soon found he was getting so much private work in Henham that in 1950 he decided to open his own garage. 'Star' barn was pulled down and 'Starr Garage' was built in its place. From here he also ran a taxi service. Charlie suspected that during his days of taxi-driving, he had transported every expectant mother in the village to the hospital to have her baby. 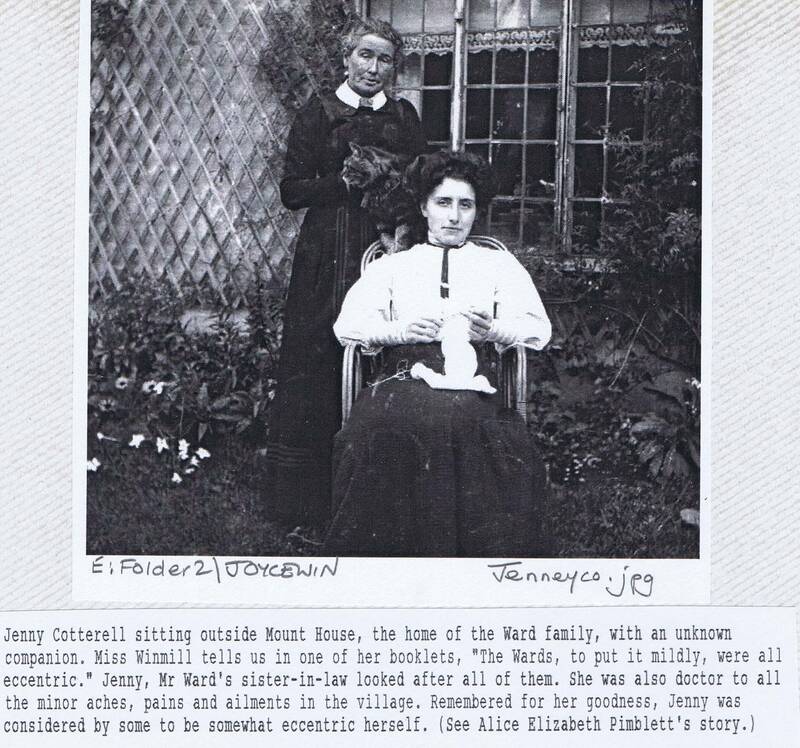 Jenny Cotterell sitting outside Mount House, the home of the Ward family, with an unknown companion. Miss Winmilll tells us in one of her booklets, 'The Wards, to put it mildly, were all eccentric.' Jenny, Mr. Ward's sister-in-law looked after all of them. She was also doctor to all the minor aches, pains and ailments in the village. Remembered for her goodness, Jenny was considered by some to be somewhat eccentric herself. 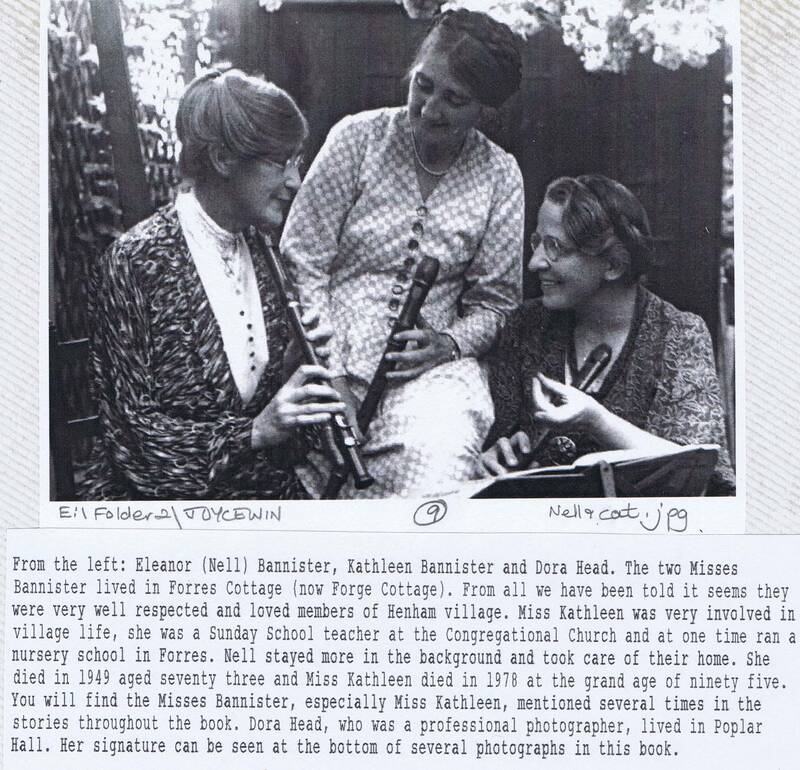 From the left: Eleanor (Nell) Bannister, Kathleen Bannister and Dora Head. The two Misses Bannister lived in Forres Cottage (now Forge Cottage). 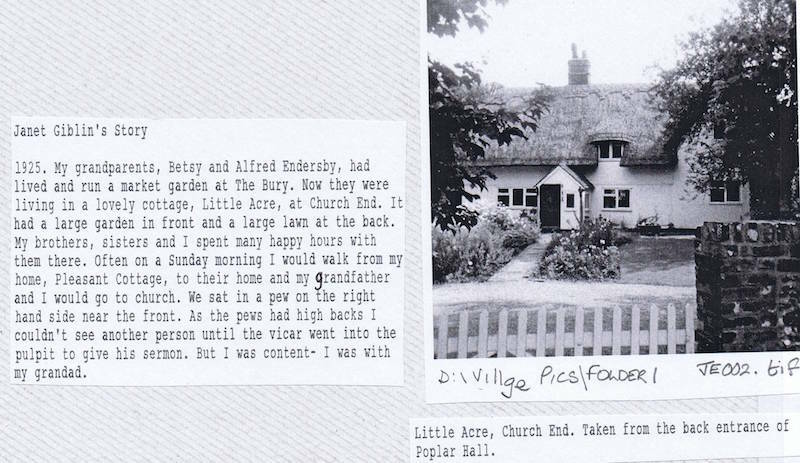 From all that we have been told it seems they were very well-respected and loved members of Henham village. 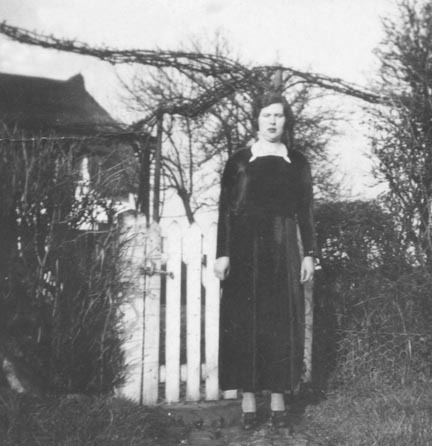 Miss Kathleen was very involved in village life, she was a Sunday School teacher at the Congregational Church and at one time ran a nursery school in Forres. Nell stayed more in the background and took care of their home. She died in 1949 aged seventy-three and Miss Kathleen died in 1978 at the grand age of ninety-five. 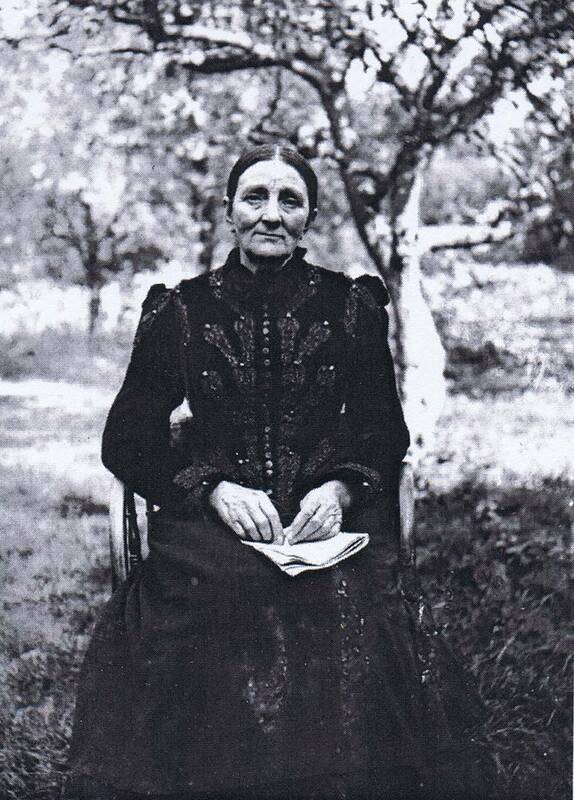 ... Dora Head, who was a professional photographer, lived in Poplar Hall. 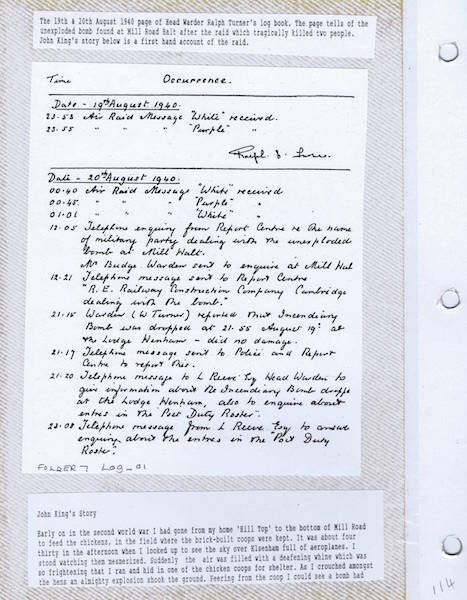 The 19th & 20th August 1940 page of Head Warden Ralph Turner's log book. 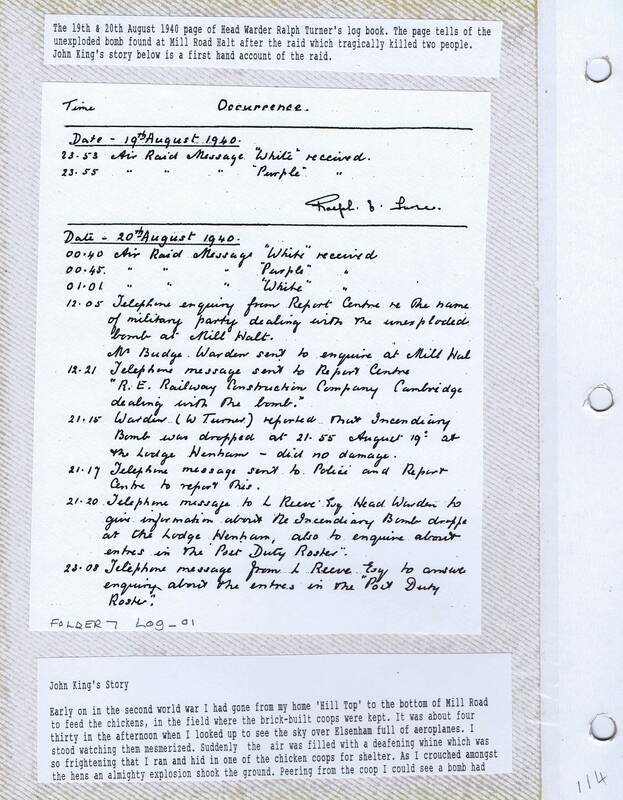 The page tells of the unexploded bomb found at Mill Road Halt after the raid which tragically killed two people. John King's story below is a firsthand account of the raid. 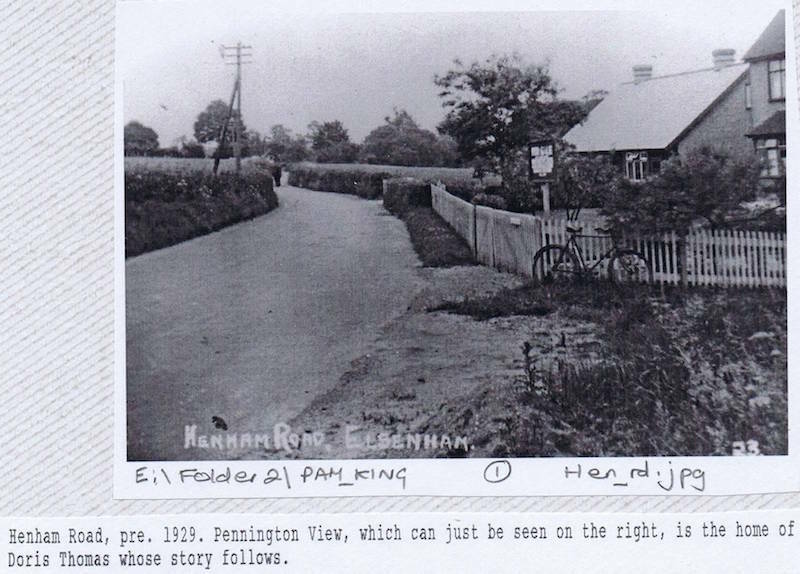 Henham Road, pre 1939. Pennington View, which can just be seen on the right, is the home of Doris Thomas whose story follows. 1920. 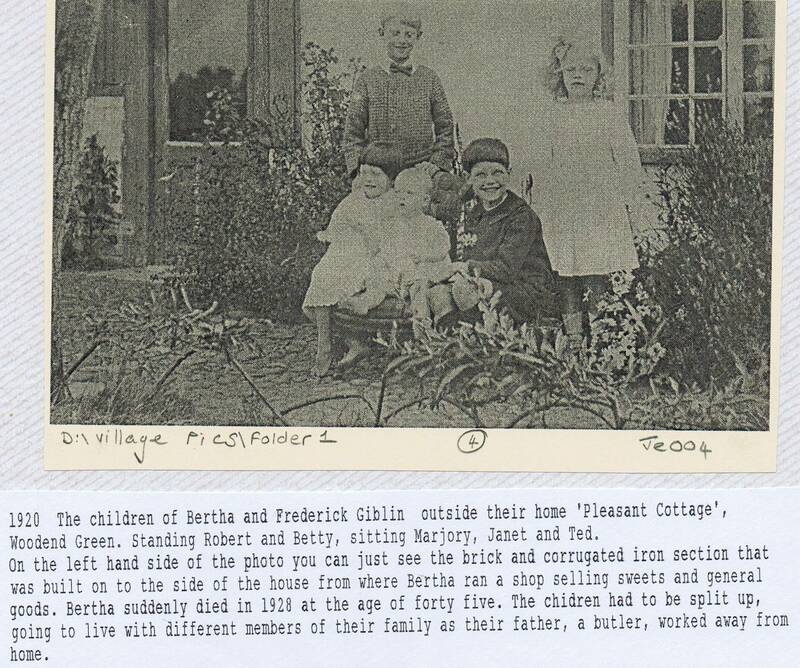 The children of Bertha & Frederick Giblin outside their home 'Pleasant Cottage', Woodend green. Standing: Robert and Betty; sitting: Marjory, Janet and Ted. On the lefthand side of the photo you can just see the brick and corrugated iron section that was built on to the side of the house from where Bertha ran a shop selling sweets and general goods. 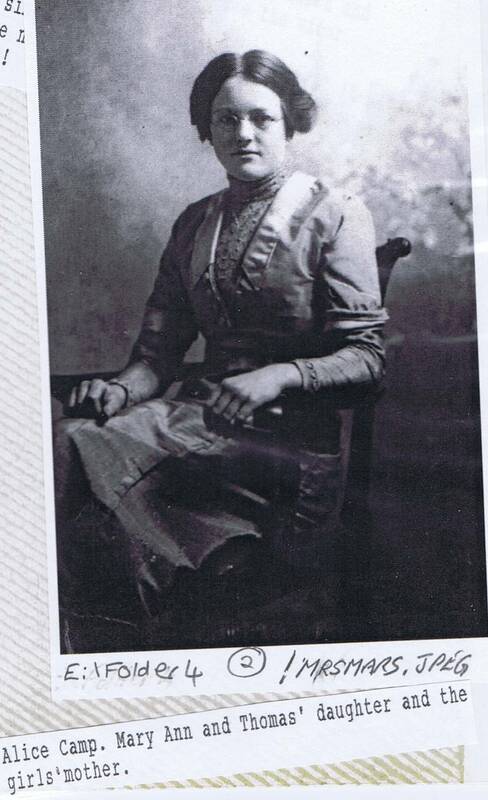 Bertha suddenly died in 1928 at the age of forty-five. The children had to be split-up, going to live with different members of their family as their father, a butler, worked away from home. The Marshall Family c1900. 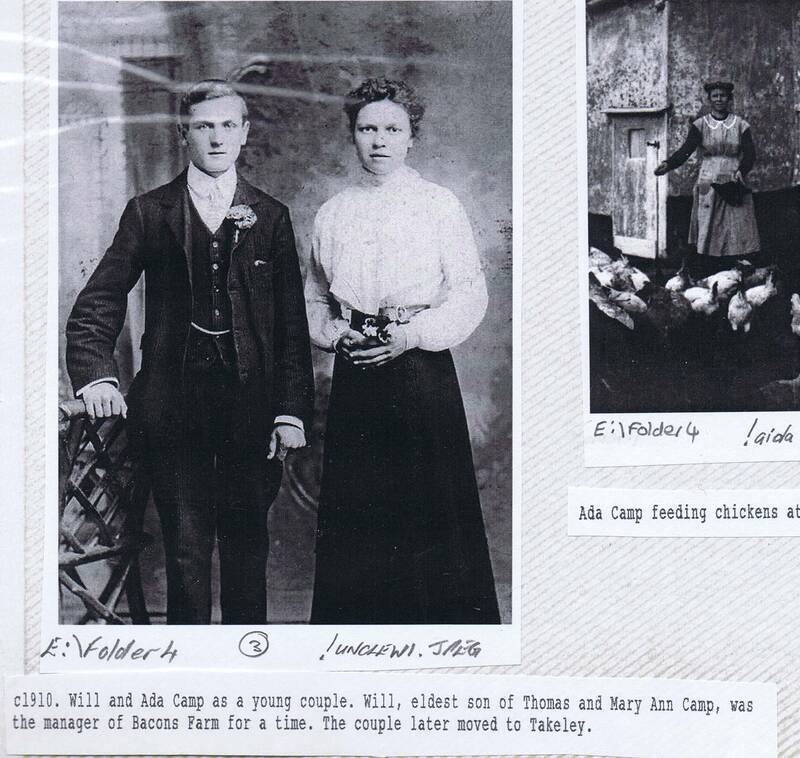 back row from the left: John (Jack), mother Jane Annie with the baby and father Robert Harry Marshall. 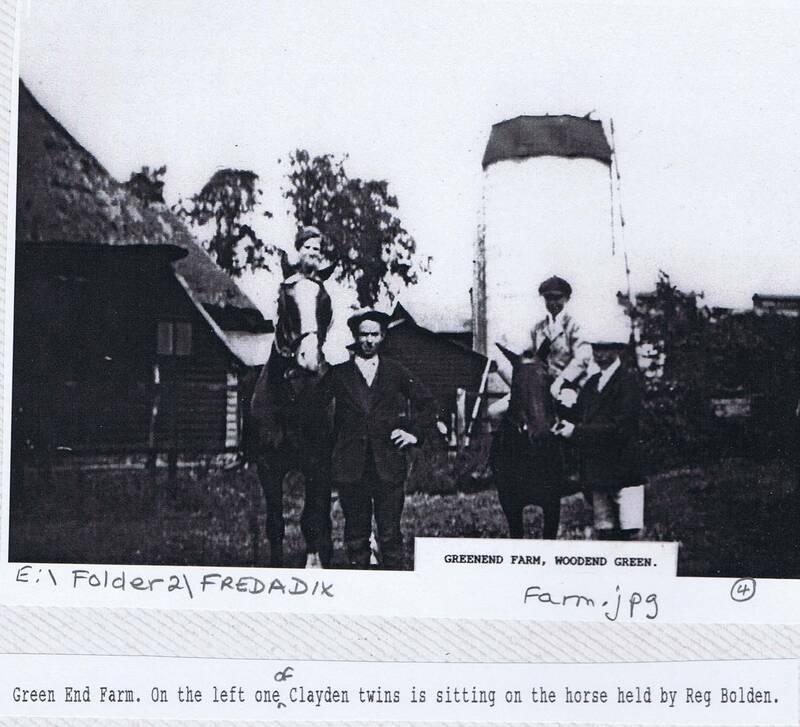 In front is Charles, William (Nora, Hazel and Joy's father), Maud, Fanny and Percy. 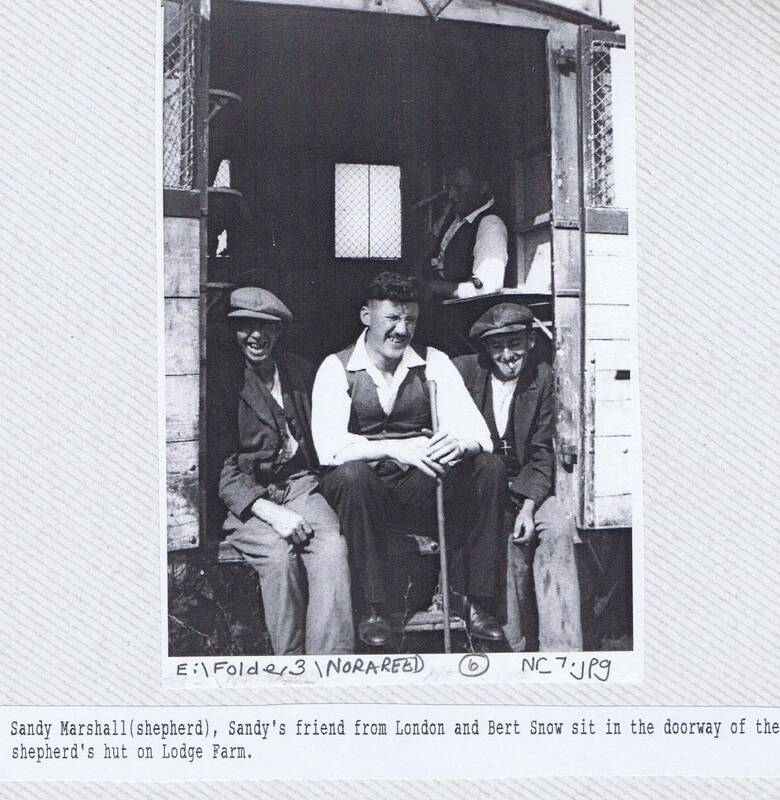 In front of Percy is Ernest (Uncle Sandy the shepherd). 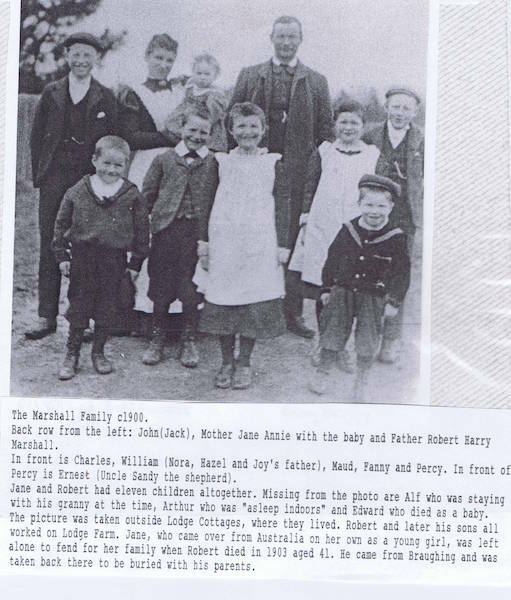 Jane and Robert had eleven children altogether. Missing from the photo are Alf who was staying with his granny at the time, Arthur who was 'asleep indoors' and Edward who died a baby. 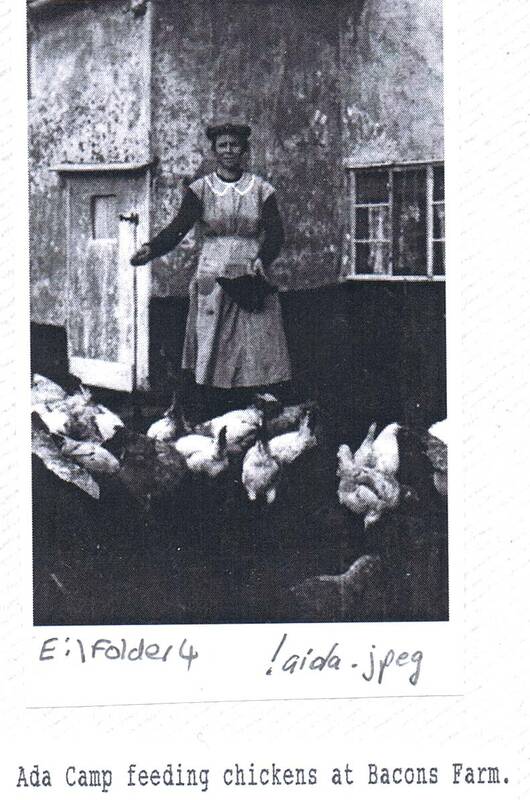 The picture was taken outside Lodge Cottages, where they lived. 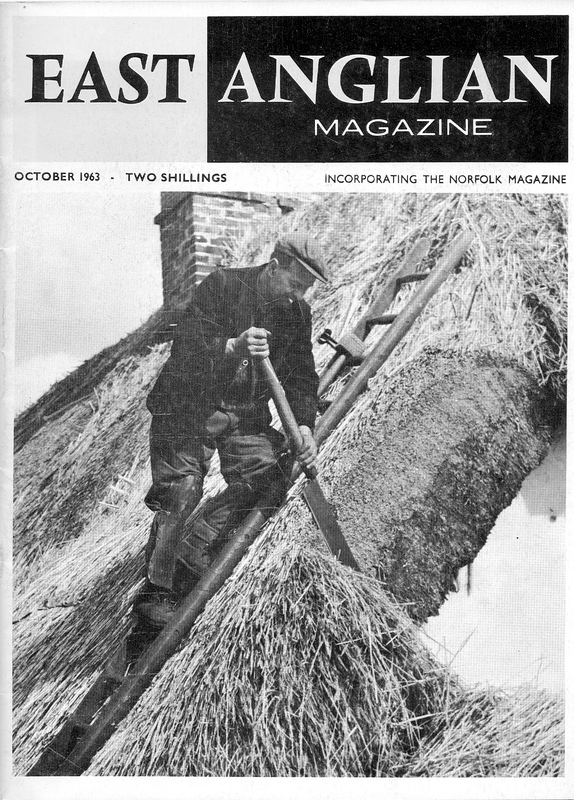 Robert and later his sons all worked on Lodge Farm. Jane, who came over from Australia on her own as a young girl, was left alone to fend for her family when Robert died in 1901 aged 41. 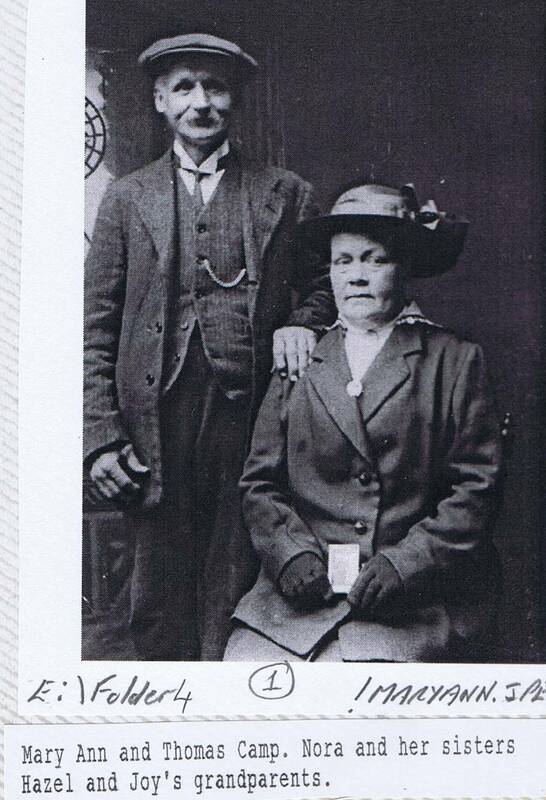 He came from braughing and was taken back there to be buried with his parents.